The seed consists of an outer husk, an endosperm (Cassia Tora Gum Split) and the ovary or germ. 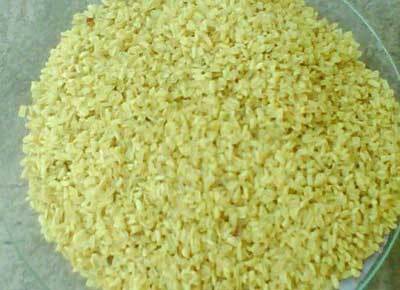 Only the endosperm or split, which contains mainly polysaccharides, is used for the production of the Cassia Gum Powder. Both husk and germ are removed in the de-husking and splitting process. The impact of the splitting procedure is that both husk and germ are loosened from the endosperm and made brittle by heating and can be removed in the subsequent purification procedure after pulverization. The split (endosperm), however, remains intact at these temperatures. Due to its much greater particle size, the split can be separated from husk and germ particles through a couple of physical cleaning steps. The splitting procedure starts with roasting of the seeds. All seeds are uniformly roasted for a stipulated period of time. During the roasting process the endosperm (split) remains intact and flexible, while husk and germ, which are more sensitive to heat, become brittle. Mechanical stress de-husks the seed and germ(in powder form) is separated from the intact split by sieving. Under roasted and Over roasted Gum Splits are Color Sortexed to provide required results. Cassis Tora Split with its versatile inherent properties is used all over the globe with different utilities in many industries like Petroleum (Oil drilling), textile, printing, food pharma, cosmetic, toiletries paper, tanneries, mining, explosives, pet food etc.